Life can be unfair. That’s a lesson you don’t want to teach your child. I hear the tears. I knock on the closed door. I walk away guessing at what happened. I busy myself in the kitchen. Then I get a text. I enter the room and hug my wounded child huddled amongst the comforter, stuffed animals and pillows. I worked so hard. I don’t understand. I don’t know what to do. It’s not fair. I wait out the storm. Tears. Lots of tears. The cell phone buzzes with DMs. I just listen and say very little. I don’t understand. I don’t know what to do. Eventually, there is room for me. I say, I know that it seems impossibly hard, but I know you can handle this. I say, I love you. I say, I know you can; you are strong. I say, I love you. I say, cry, be angry, lean on people who love you. I sit there for a long time. And slowly, I see a hint of a smile. The result of a DM that lifts her up just a little. Ah, there is hope. Is that blue sky peeking through? I offer just a bit of advice, with lots space for her. It’s late, but the skies have cleared with talk of how to get extra credit in history. Soon it’s off to bed with a thank you momma. I love you. Life can deliver messages that we aren’t ready for; that we don’t expect; that feel coldly unjust. But life also gives us people who love us and tomorrow, and extra credit opportunities. 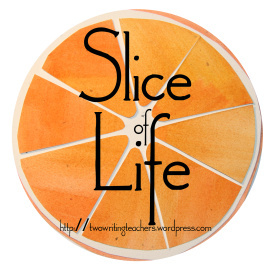 Thanks to Anna, Beth, Betsy, Dana, Stacey and Tara of Two Writing Teachers blog for hosting the Slice of Life March Story Challenge. Read other bloggers slices here. Alls well that ends well. She is so lucky to have you there for her. You were patient and observant, waiting it out until she was ready to turn to you. It was a dance of emotions. Watching your child hurt is the hardest part of being a mom. You handled the situation beautifully. You sound so patient in this, Juieanne, and loving too. There are no “right” words when our children are upset, but helping them know they can get past the hurt will help in so many ways in all their lives. Glad for her there is that blue sky! A wise mama who knows when to talk, when to listen, when to hug. I really like how you structured this with her quotes in between your narration. I could feel how devastated she was. Some of life’s lessons are hard, especially for teenagers. You offered a sympathetic shoulder and love, but she had to go through it herself learning strength from you. I love this:But life also gives us people who love us and tomorrow, and extra credit opportunities. I don’t have kids of my own but I have about 160 students under my wings at school and it breaks my heart to see one of my kiddos hurting. Love the message you shared with your child! Great words to live by!